Summer time is here and so is the produce. Lets talk about pickling again. 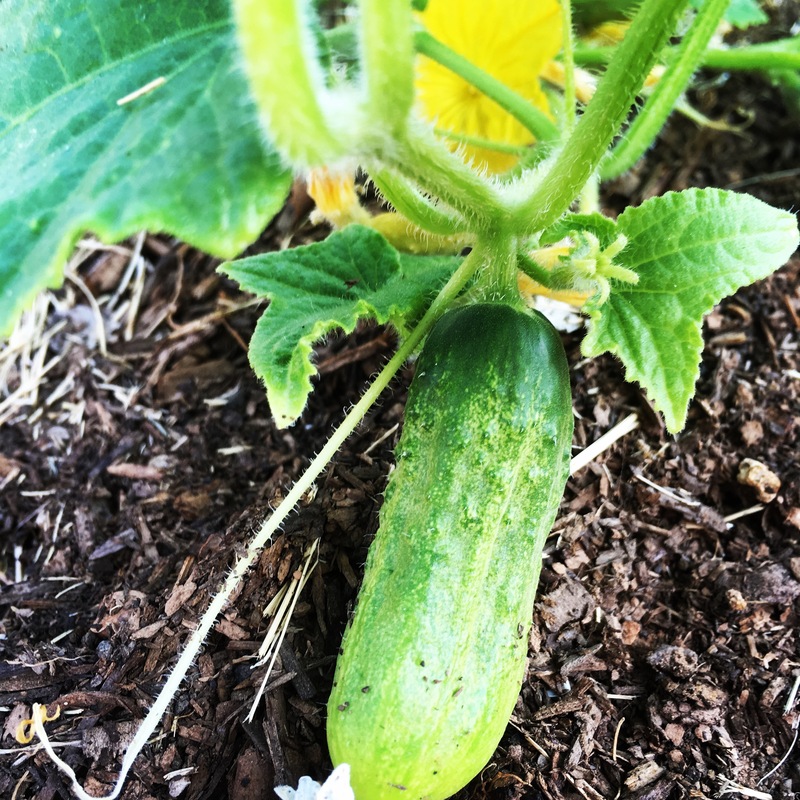 I wrote a blog about pickling in Sept. 2013, letting you know a few things about pickling. I wanted to remind you of a few things. Pickling is easy and fast. What is the hard is waiting for it to pickle. Please use water without chlorine. Chlorine will make the produce soft and I know you would prefer a crunchy pickle. Please use the salt that the recipe is asking for. Never use table salt when canning, it has anti caking agent and iodine that will give the pickles a bad taste and turn them a dark color.If you read the blog in 2013 you will remember that I like setting up little bowls to place the spices in for each jar. This makes it go fast, efficient and makes sure that the spices are evenly distributed. Lets talk about spices. Buy spices from a supplier with a rapid turnover. Spices lose their flavor with age and stale spices can spoil the taste of any dish or pickles.Ground spices lose their flavor within just a few months: therefore, it is usually better to buy whole spices and grind them as you need them. You can use so many spices when pickling. If you like heat, use red pepper flakes, black or brown mustard seeds, pepper corns, cayenne powder, chili powder, hot Indian curry powder, or red dried chiles. Here are a few more spices you may want to use: Cardamom, Cinnamon, Fenugreek.Clove, Coriander, Cumin, Curry Powder, Celery Seeds, Bay Leaves, Fennel Seeds, Mustard Seeds, Nigella, Nutmeg, Saffron, Dill seeds, Turmeric, Garlic, Ginger, and Star Anise. Star Anise comes by its name honestly, with it star shape and a licorice taste similar to regular anise, only stronger. Star Anise is a dried fruit seed pod of an evergreen tree ( Illicium Verum) grown in southwestern China and Japan. It is about one inch high with eight segments and a dark brown rust color. Like regular anise, star anise gets it distinctive licorice taste from a chemical compound called anethol. However the two are not related botanically – Star Anise is a member of the Magnolia family. 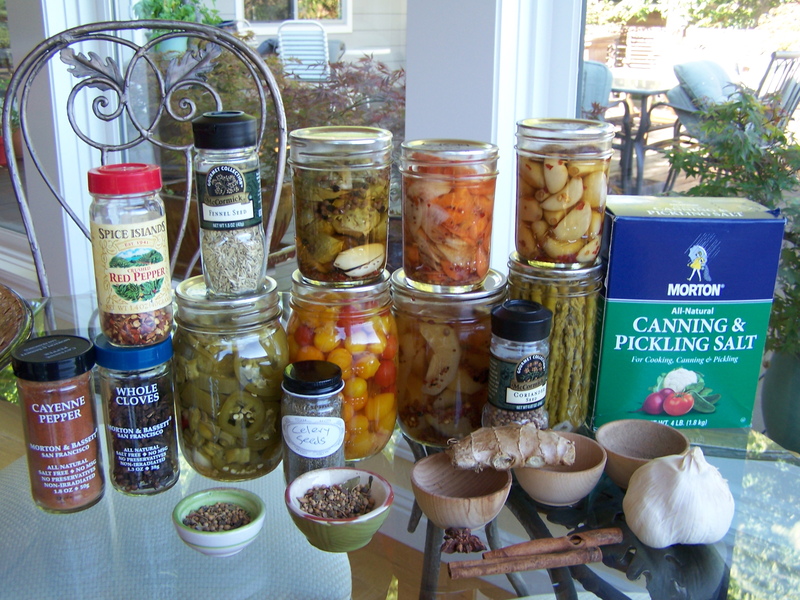 To know more about pickling, please go back to the blog from Sept. 2013 . Happy Canning and Pickling. salt weights 5/8 an ounce, which is close to the pickling salt, but not the same amount. tablespoon weighs 1/2 an ounce. 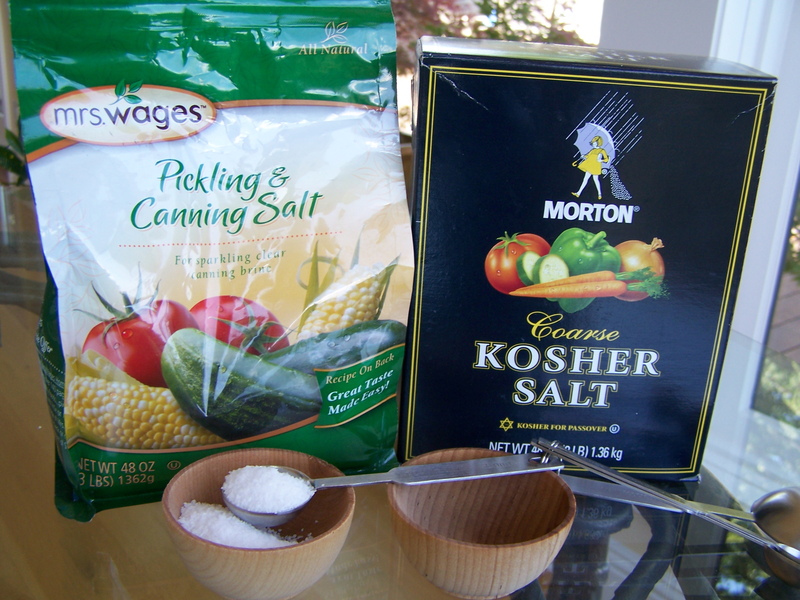 You can use table salt when canning but the pickles will turn a dark color, and are perfectly safe to eat.Canning salts are available in most supermarkets, where other canning supplies are sold. What it all boils down to is Pickling salt is the standard and one tablespoon weighs precisely 3/4 of an ounce. So if you have a recipe asking for one tablespoon salt it needs to weigh 3/4oz . So if you do not want to spend the money on a scale to measure your salt use pickling salt! Some of this information was found on Marisa McClellan Food In Jars Blog.